Grassy Ridge - Your Private Hideaway w/ Hot Tub! 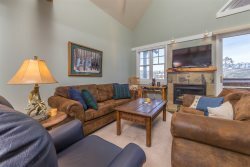 Your own private hideaway is waiting for you in Bozeman! The Grassy Ridge Lodge is nestled in a secluded valley featuring gorgeous views of the Bridger and Bangtail Mountains. It is just moments away from Bridger Canyon and only 25 minutes away from all Bozeman has to offer with its’ restaurants, cultural attractions and Gallatin Valley airport. Enjoy a true Montana experience on 60 pristine mountain acres with waist-high grass, abundant flowers and wildlife. This three bedroom, three bath home is always relaxing to come home to. Mixing the best of the old and new, the décor includes old-world antiques, comfy furniture, and all the modern amenities. A cozy living room is decorated with Victorian antiques, cathedral ceilings and a big stone hearth looking out on Sacagawea Peak. The wonderful eat-in gourmet kitchen comes fully-stocked with everything you need. A solid teak dining table seats six people or can be expanded to seat ten. The home has a two-way view, allowing you to view both the sunrises over the grassy ridge and sunsets over the mountains. The home comfortably sleeps six people. The master bedroom includes a skylight for gazing up at the stars and a grand, old-style tub in the master bath, looking out into the trees and Battle Ridge. The hot tub is set amidst the trees with views of the Bridger Mountains, perfect for relaxing after a day at Bridger Bowl. The large deck is great for barbecues, with a solid-wood dining table that seats for ten people. The front porch catches the morning sun and has a table and chairs for you to have your morning coffee. Another fun feature of this home is the gazebo, located on the west side of the home, out the end of the ridge. It has a dramatic 270 degree view and is perfect for reading a book or watching the sunset. This home is perfect for the outdoor lover and adventure seeker! - Gorgeous view of Bridger and Bangtail Mountains and nestled on 60 acres to explore! Beautiful Mountainside cabin! Our family of 5 loved staying at the Grassy Ridge Cabin! It has a beautiful view of the mountain and it tucked away at the end of a road. It is uniquely decorated and very comfortable. We utilized the fireplace and hot tub. We were about 10 min drive to Bridger Bowl Ski Resort. If planning on staying here in the winter make sure you have four-wheel drive. We had my graduation party in this lovely place. Family from all across the country came to visit and this was the perfect place for a reunion. The scenery is to die for and the wildlife abundant. Thank you for such an accommodating stay. It was filled with life and adventure for all! PS- If you go for a walk up the dirt road, there is a bird who is very friendly...also kinda crazy the kids nicknamed him "crazy bird." He is a hoot! :) Thank you, The Brown-Johnson-Still Families. This little family could not have been happier. Excellent ski conditions at Bridger, sunsets in the hot tub, cheese and wine by the fire. Lots of joy in looking at all the curiosities - the "choo choo" stamp collection was a favorite for our little 18 month old. And now it's time to plan our next trip out here. Hopefully the playful red fox won't miss us too much. Love, The Williams from Atlanta. Despite a broken tow and 5 stitches from a cross-country skiing fall, we had a GREAT time. Comfortable, interesting accommodations and great neighbors who plowed and told us about a wonderful place to ski. We don't want to leave... PS- We so appreciate the opportunity to stay in such aesthetically designed house with views of peaks, constellations on the outside and gorgeous Thai furnishings on the inside. Thank you!